Celebrities had a meltdown Wednesday night after Jeff Sessions’ confirmation as the next attorney general. “[A] double whammy of total embarrassment #JeffSessions has been confirmed the day after @BetsyDeVos disgusting,” Sandra Bernhard tweeted. a double whammy of total embarrassment #JeffSessions has been confirmed the day after @BetsyDeVos disgusting. “If David Duke….DAVID!…DUKE!… thinks you’re right, then you are unequivocally wrong. The confirmation of @jeffsessions is beyond words,” Chris Evans tweeted. ICYMI: #JeffersonBeauregardSessionsIII was deemed too racist to be a federal judge but he was just confirmed to be US Attorney General. “Rights are won only by those who make their voices heard.” – Harvey Milk. SHOUT OUT TO THE JUDICIAL BRANCH! YOU’RE ALL WE GOT! In Black History Month, GOP confirms AG who was deemed ‘too racist’ to be a federal judge. That about sums up this entire shitshow. Nice to see the little guy who works hard to fight equality & is too racist to be a federal judge catch a break. KKKongrats Mr. Sessions! 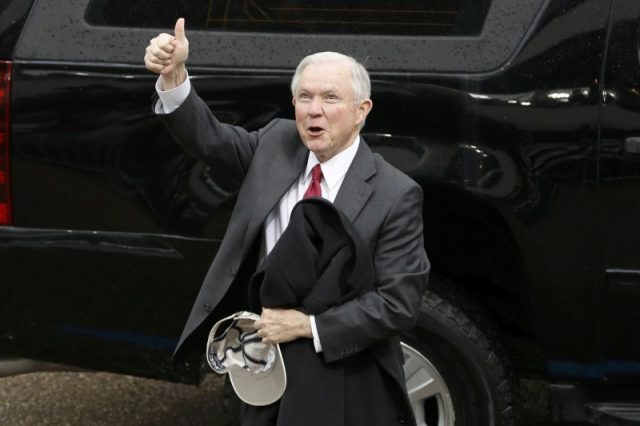 Jeff Sessions has been confirmed.